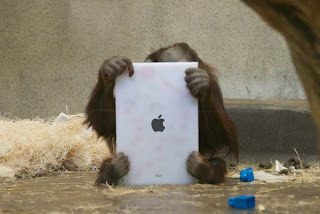 Orangutans across the world may soon join the ranks of millions of humans as proud owners of new iPads. As strange as that may sound, a conservation group is testing its "Apps for Apes" program, allowing orangutans to communicate with each other remotely via the iPad's video chat technology. Orangutan Outreach founder Richard Zimmerman has already donated iPads to zoos in Milwaukee, Houston, Atlanta and Florida, and will soon send iPads to the Memphis Zoo, the Center for Great Apes in Florida and to the Toronto Zoo. Orangutans are considered to be amongst the most intelligent of primates, making them a good case study for the interactive technology. "It's not a gimmick," Zimmerman told Yahoo News in a phone interview Tuesday. "If they don't want to do it, they won't. There are actual measurable benefits." Zimmerman said that orangutans in zoos and other primate facilities usually receive all the food and love they need. However, during winter months they are forced to spend long periods of time indoors, which is counter to their natural habitat. And living indoors for extended periods of time can result in boredom and stunt social growth among other primates. "They need stimulation, especially indoors," Zimmerman tells Yahoo News. "The zoo keepers can see the benefit from this sort of enrichment. We're doing this as enrichment as opposed to research. But researchers are getting involved, that's just not our jurisdiction." Scientists and layman alike have long speculated on ways to better indoctrinate primates and other animals with human technology. Dolphins have already demonstrated an ability to interact with iPad technology with researchers using it as a language interaction device between dolphins and humans. There are even several iPad games made specifically for cats. But even more interesting possibilities present themselves once a number of zoos have their orangutans acclimated to using the iPads. Zimmerman said he hopes they will be able to use Skype or the iPad's FaceTime feature to communicate remotely with orangutans at other zoos during "play dates." Zimmerman said he recently visited Jahe, an orangutan at the Memphis Zoo who used to live at the Toronto Zoo. When Zimmerman showed Jahe a photo on his iPhone of some of her relatives still living in Toronto, she appeared to recognize them. "Given an opportunity to demonstrate that intelligence, it's pretty amazing," Zimmerman tells Yahoo News. The biggest obstacle for now is coming up with the funding to purchase more iPads. Orangutan Outreach refuses to use its funds on the tablets, saying its priorities must be toward conservation and helping to rescue orangutans that are victims of violence in the wild. Zimmerman said so far he has been unable to reach Apple directly about any possible donations for the project. "I could get them to the zoos tomorrow," Zimmerman said, if Apple were to make such a donation. "Our Plan B has been to hopefully get their attention through this effort."